The Bridgerland Audubon Society has an elite group of birders; the 200 bird club. This is a group of people who have seen 200 species of birds in Cache Valley, Utah, within the space of one year. It's my aspiration to become a part of this privileged group, but due to current limitations (5 kids LOL), I won't be joining this group any time soon. So I've set my own goal; 100 birds. It'll be tricky, but it should be doable. I started counting on Jan. 1st, and as of today I'm up to 48 species. Almost half there! Yippee! 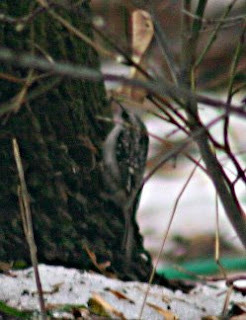 Number 48 was the Brown Creeper, which I saw on Saturday (see the cute little birdie pic on the right). Brown Creepers are one of my favorite birds, so I was happy to see him visiting my yard.